Price: TBC - upcoming Kickstarter. 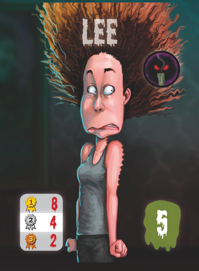 Mike: So you may have heard us mention once or twice the upcoming game from Tinkerbot Games Ghostel. Ghostel is set in Creepstone Manor which has been empty for a hundred years. However it has now been reopened as a hotel much to the annoyance of the resident ghost Spookie. Here’s where you come in. 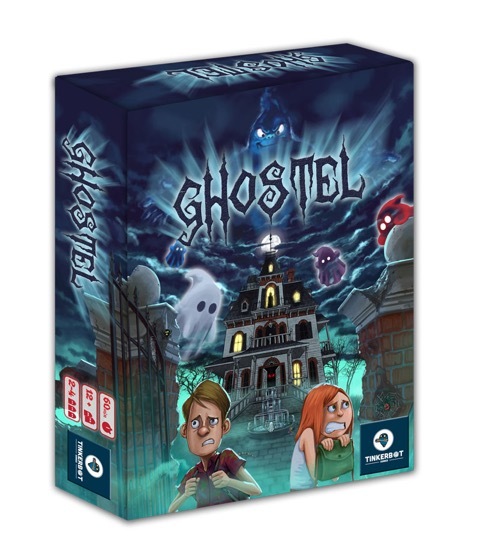 In Ghostel you are one of Spookie’s Minions vying for the position of top ghost by scaring away visitors to Creepstone Manor. The game has 2 phases day and night. In the night phase the ghosts come out to play and do their level best to scare away the patrons. In the day phase new visitors will show up and existing ones calm down to prepare themselves for another night of bumps and frights. 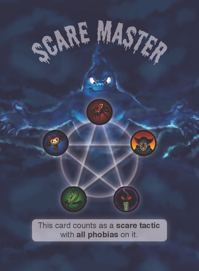 It is also during this day phase that the ghosts prepare for the night by gaining Spookie favours, learning phobias and purchasing boo dice. I have had the pleasure of playing this twice now and David played it for his first time at Dragondaze. So David what did you think? David: Firstly I liked how easy it was to set up and teach. Bevan explained the rules to us and I got it straight away. In the version we played there were 3D printed ghosts which have to be my new favourite game token. They looked awesome and fit in with the look and feel of the game. I like it in games when there are hidden jokes. 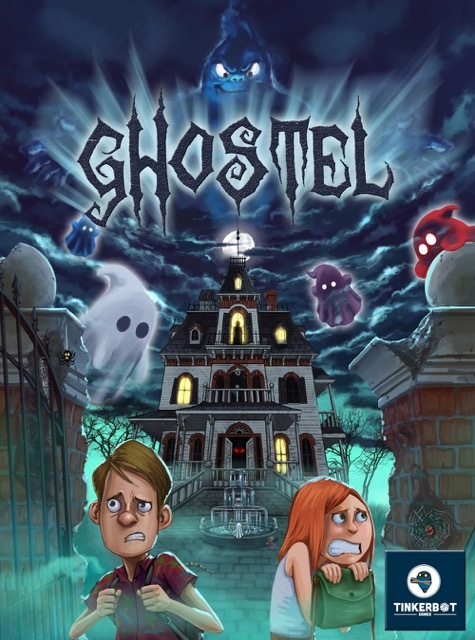 The guest’s names in Ghostel are all from famous ghost programmes like Ghostbusters and Scooby Doo. I can’t wait to find out what they will call the ghosts. Mike: 3D GHOST MEEPLES!!!! I thought nothing could beat the animeeples in my Agricola set but these little ghost dudes are fantastic. Totally agree with the set up and rules. Both times I have played this the group picked it up very quickly with little or no rule checks required. This is a good sign that some thorough play testing has occurred. It’s also a solid worker placement game with a little bit of luck needed. If you have played and enjoyed waggle dance you will be at home here. 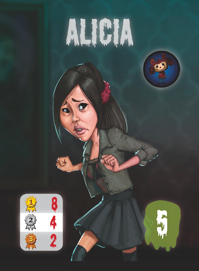 Each turn you will roll your dice and place these on the visitors as you move around the board. In order to scare away a visitor you need to break that visitor’s boo score. So for example if a visitors boo score is 10 you will need the help of the other ghosts to break it. 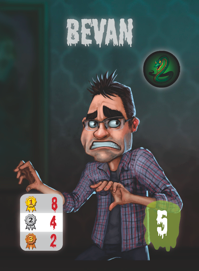 For those that have played Smash Up it’s a similar mechanic in how the bases are broken and scored. Again for me it’s that familiarity of mechanics with the addition of a few new ideas that makes it fresh, entertaining and easy to play. David: I quite like worker placement games. Sometimes though they can be a bit complicated and have too many options. This is why I enjoyed Ghostel as much as I did. It can be played with new comers to games but also is challenging enough for experienced gamers. I would like to play this with my sister when she is older I think it would make a great family game. I look forward to the next time I can play this. Mike: It’s nice to find a spooky themed game you can play with the family. We have followed the journey of this game very closely and even early on in its prototype phase it has captured our attention. A few months ago they held a completion to get your face in Ghostel. Here are the lucky three winners. As you can see for yourself the artwork is beautifully done. Seeing these cards now I cannot wait to get my hands on the game. Ghostel ticks all the boxes for a game we would not only purchase but get to the table regularly. 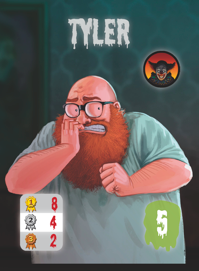 For that reason we cannot recommend it highly enough and wish Tinkerbot Games all the best with the upcoming Kickstarter Campaign. 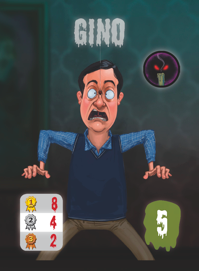 P.S We interviewed Gino at Dragondaze where he talks about Ghostel for our 2nd podcast. You can download it on iTunes or our RSS feed.